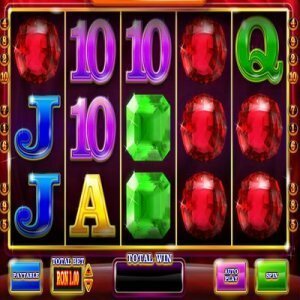 [miau] There are a lot of companies out there attempting to produce online video slot machines that are completely original, to the point that some of the games no longer even function as slot machines. Some other companies, however, have decided to stick to the classics. This is the case with Super Diamond Deluxe slots. Rather than trying to be something new and groundbreaking, the designers of Super Diamond decided that they would stick with a classic theme—gemstones—and simply do it right. The end result is a good looking, smooth playing slot machine that has many fans out there in the casino land. The first thing anyone will probably notice about Super Diamond Deluxe is that it’s really a no-frills type of game. Apart from the sparkling gemstone theme, which does look great on these new HD screens, it is a basic 5-reel, 10-payline machine that doesn’t get carried away in trying to create unique symbols. Basically, you have gemstones like diamonds, rubies and emeralds, along with some playing card symbols. 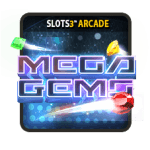 It couldn’t get any simpler, and that’s ironically what acts as a huge draw for many slots enthusiasts out there who are fed up with games that are too busy and complex. When breaking it down, Super Diamond Deluxe is a purist’s game; it is essentially an old-school fruit machine, only instead of fruit the creators have used gemstones. Unfortunately, though, there are some negatives to going with such a classic theme. For instance, you won’t find any wilds, scatters or cool bonus games with Super Diamond Deluxe, nor will you find a bunch of ways to win. There is a nice progressive jackpot that keeps building up, but it could use at least a free spins feature. Give back to the fans a little bit! For a simplistic game like Super Diamond Deluxe, you can’t expect a ton of customizable betting options. Everything on this game works in a fairly straightforward fashion. That is to say, what you see is what you get: You simply enter your bet, decide on the number of lines, and place your wager. There is a very large betting range, however, so this is a good game for players of all budgets. You can get as low as 0.20, or as high as 500 total per spin. Though with not as many ways to win, the game doesn’t attract too many high rollers. At the end of the day, Super Diamond Deluxe serves as a solid slot machine for two types of players: The players who like the pure, no-frills types of slots machines, and players who like to chase progressive jackpots. Other than that, it doesn’t cater to many other demographics.